New figures show a jump in incidents from 2016, higher than the five-year average. An Air Canada Boeing 777-300ER (C-FIVW) jet airliner is met by emergency vehicles at Vancouver International Airport, Aug. 30, 2017. OTTAWA — A national pilots association is raising alarm bells over new accident numbers showing a year-over-year jump in incidents involving commercial airliners. The Transportation Safety Board says the increase in airline incidents overall is partly due to a higher number of flight training accidents. 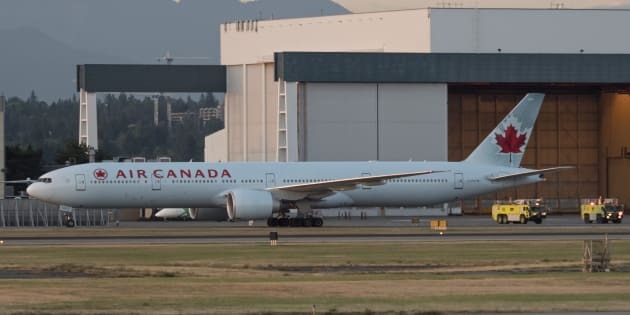 The Canadian Federal Pilots Association argues the jump in incidents can be traced to federal government cutbacks in oversight. ​​​​​​​New figures today from the Transportation Safety Board show that there were 94 incidents in 2017 involving commercial aircraft operators, a jump from the 63 recorded in 2016 and higher than the five-year average of 79 incidents. Large passenger airliners were involved in nine of those incidents last year. The board also says the first known collision between a commercial aircraft and a drone was among the 921 overall aviation incidents last year.